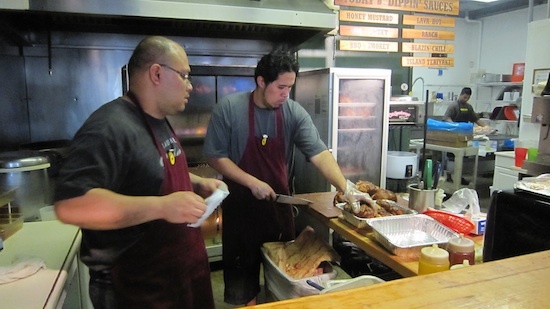 After our visit to the Dole Plantation, we stop by Maui Mike’s to sample the best fire roasted chicken in Hawaii. I’m not exactly sure why the place is call Maui Mike’s when Mike doesn’t have a location in Maui. I guess Oahu Mike’s just doesn’t have the same ring to it. 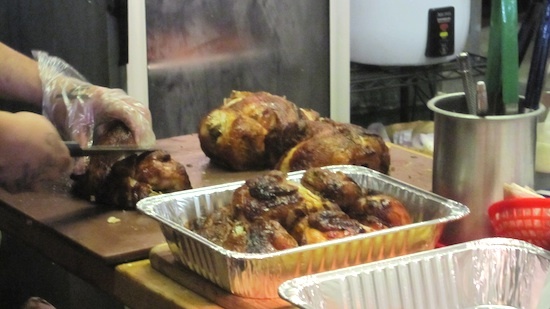 What makes Maui Mike’s stand out is their chicken. It really is the best tasting chicken I’ve ever tried. Mike’s chickens are 100% fresh and natural. They contain no steroids, hormones, antibiotics or any other artificial or synthetic additives of any kind. They are raised in huge free-roaming enclosures, each larger than a football field. They are never caged, and enjoy a healthy all-natural diet. Not only does this produce a better tasting chicken but it also makes you feel better knowing it lived a healthy life before it became your dinner. The chickens are made to order. They don’t put it in the fire until your order it. 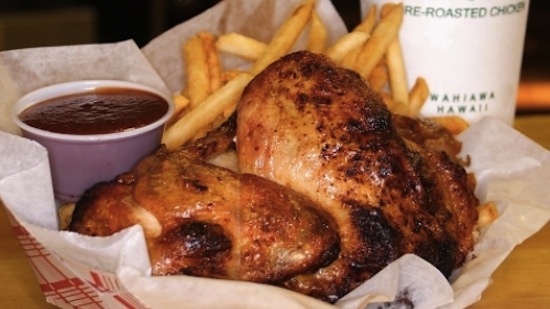 Once you place your order, the chicken are roasted over an open flame and come out so tender and juicy that it makes your mouth water just thinking about it. The chicken are served with a selection of dipping sauces, not that it’s needed. The service staff is very friendly. They even offered to turn my whole chicken into all white or dark meat. Best of all, the prices are ridiculously low. A half chicken with drink cost only $7.99. A full feast with one whole chicken, two sides and four dipping sauces cost only $13.95. It’s the best chicken value in Hawaii. Maui Mike’s is located off the beaten path in Wahiawa. This is about a 30 minute drive from Waikiki. It is well worth the trip! 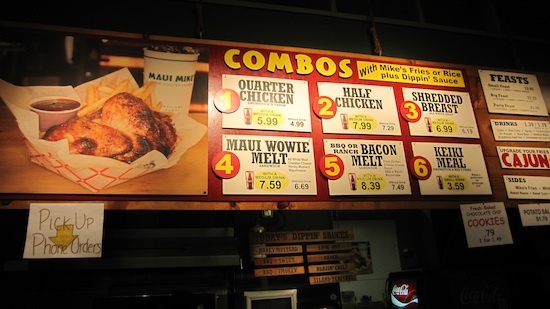 Your Hawaiian vacation would not be complete with a trip to Maui Mike’s.